In terms of unlikely animal pairs, a dog and a donkey rank way up there. However, that’s probably what makes their friendship so wonderful. Kolima is a 1-year-old Anatolian shepherd pup who suffers from wobbler syndrome, a neurological disease that affects a dog’s spinal cord. It can make their gate unstable and causes a great deal of pain when the animal tries to walk or even stand. Due to her condition, Kolima had a hard time playing with the other dogs on her owner Felice Caputo’s farm, so she’d often be on her own. That is, until she met Paulo. Paulo is Caputo’s 6-year-old donkey, who was also somewhat of a loner because of his stubborn nature. Yet for some reason he took to Kolima almost immediately, and suddenly an amazing friendship was born. Or perhaps their bond goes deeper than friendship. 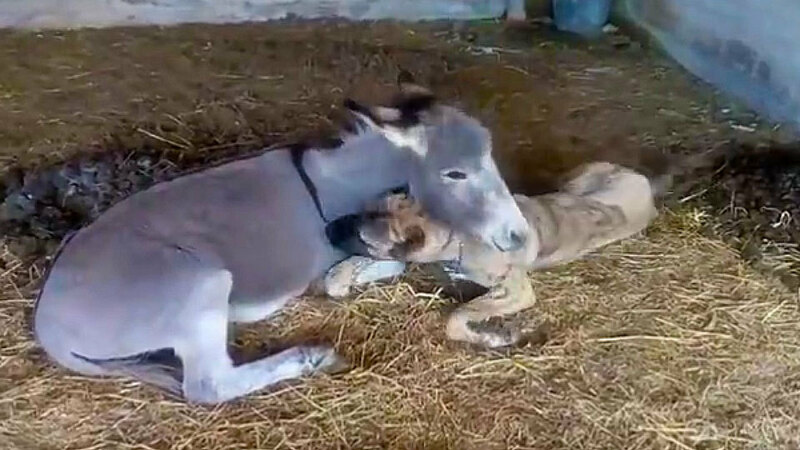 On Facebook, Caputo wrote that “Paulo adopted Kolima.” Apparently Paulo seems to recognize Kolima has difficulties getting around, so the donkey takes care of her. In the video, you can see he gets down on Kolima’s level to play with her, keeps her warm by putting Kolima’s head under his neck and just nuzzles her like a good friend would. What’s particularly interesting about Paulo’s desire to adopt Kolima is that it’s not in a donkey’s traditional nature to do such a thing. Donkeys are normally stoic creatures who prefer to be on their own rather than in a pack. They’ve actually been known to fight with other donkeys to the point of drawing blood. And of course, they can be quite stubborn as they’re often described to be in literature. So Paulo is an unusual little burro for having a soft spot for this disabled dog, but that just makes him all the more endearing. His care is also giving Kolima a reason to get up and around despite her chronic pain. Before that, she’d just lie around, discouraged by her disability. It’s amazing what the power of friendship can do.